Today, Americans take equality for granted and view elites—whether political, financial, or media—with hostile suspicion. But it wasn’t always this way. Even during the late-eighteenth century, a period we often associate with revolutionary fervor, most colonists accepted inequality as either ineradicable or (as elites preferred) natural. Most people knew their place, even if they occupied it grudgingly, and deference and paternalism shaped most social relations. The Paxton Boys understood their role in Pennsylvania’s defense policy. Frontier settlements such as Paxton served as protective barriers for elites in the city of Lancaster and for provincial authorities in Philadelphia. 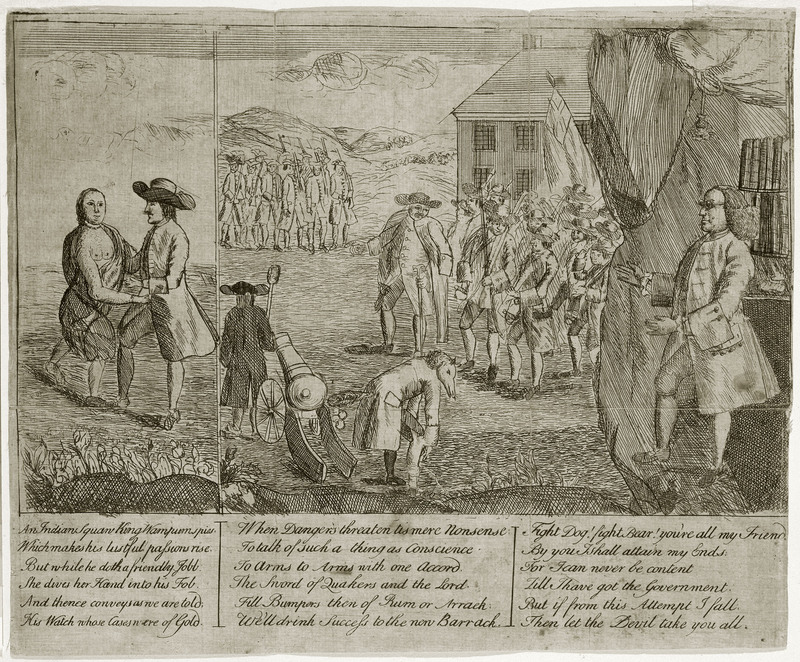 James Logan and Edward Shippen had established settlements on Pennsylvania’s western and northern frontier in the 1720s and 1730s to serve as the first line of defense in case of attack. Being “under some apprehensions” about an attack “from the northern Indians,” Logan “thought it might be prudent to plant a Settlement of such men as those who formerly had so bravely defended Derry & Inniskillen as a frontier in case of any Disturbance” (Logan to Steel). The settlement at Donegal, midway between Paxton and Conestoga Manor, was “made by some of the first Irish that came over … upon some appearance of misunderstanding at that time with the Indians, against whom we thought those People might prove a considerable Security” (Logan to Penn). Settlements of friendly Indians, such as Conestoga Manor, also functioned as early-warning systems for frontier disturbances. These frontier outposts, populated by Presbyterian Scots-Irish, protected the city of Lancaster. Founded in 1730, Lancaster grew quickly. By the 1750s, a “wide disparity in the economic status of the residents of the town” existed and wealth was “concentrated to a surprising extent in the hands of a relatively small number of families” (Wood 66). Some of the town’s wealthiest residents, including Edward Shippen, were involved in the fur trade, which depended on the peaceful frontiers that Pennsylvania’s defense policy sought to maintain. These wealthy families constituted an English-speaking elite in Lancaster. This elite distinguished itself from the ethnic Germans, who made up the majority of the town’s population (nearly 70 percent in 1759), by intermarrying and supporting one another through patronage and trade. Most were associated with the Penn family and Pennsylvania’s proprietary party, and most attended Lancaster’s Anglican St. James church. Its minister, Thomas Barton, described his congregants as “people puffed up with a notion of their superior knowledge, fortunes, and families” and noted that most “seem apprehensive of ranking with the meaner sort” (Barton to Burton). 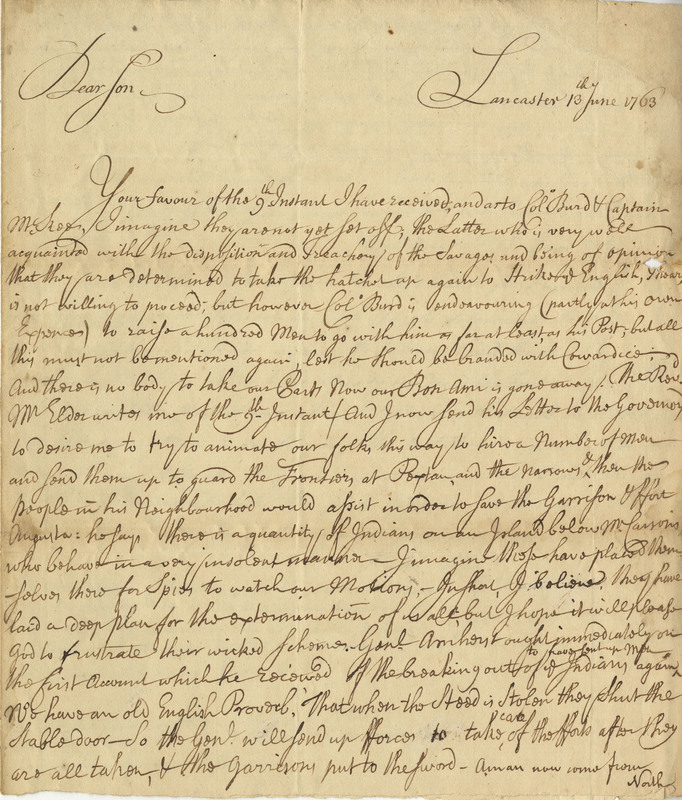 Jasper Yeates, an aspiring lawyer who moved to Lancaster in 1766 and quickly married into the Shippen family, referred to fellow residents as a “class of Plebians we don’t approve of” (Jasper Yeates to Duncan Campbell). It was the Paxton Boys’ anger at this local elite that motivated their violence in December 1763. 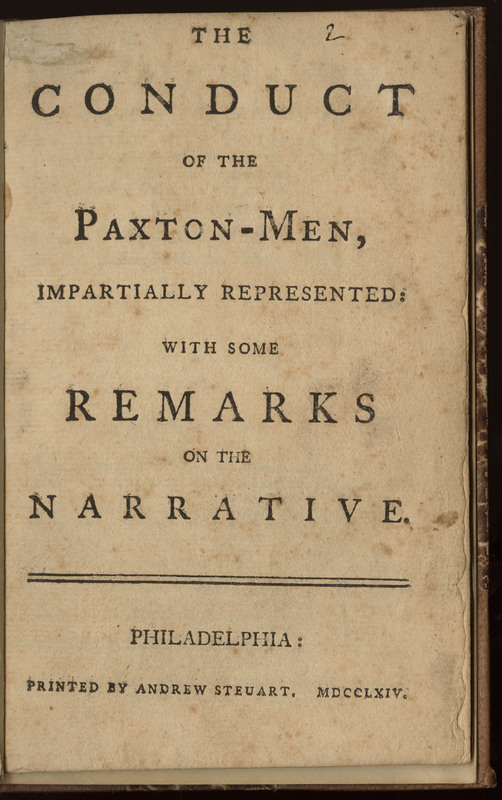 Most historians, prompted by the 1764 pamphlet war to focus on Philadelphia’s provincial authorities, overlook the fact that the Paxton Boys’ December violence stemmed from a strained relationship between elites in Lancaster and the Scots-Irish on the frontiers. This relationship, of course, was not between equals. The frontiersmen typically offered deference—they accepted the prevailing, unequal social order—to secure the “friendship” of these elites, who possessed economic and social capital. Elites lent money, rented or otherwise policed access to land, hired laborers, and controlled many opportunities for work or social advancement (Schultz 210). These “social superiors” were also “expected to … extend assistance in time of need” (Wrightson 149). 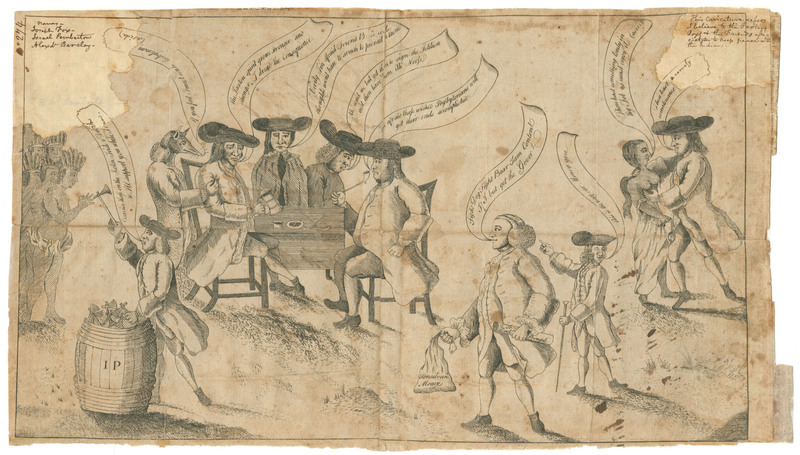 Pennsylvania’s backcountry settlers defended themselves in times of crisis, but they expected elites to aid them by authorizing scalp bounties, establishing militia units, or providing funds to purchase arms. The December violence signaled that the Paxton Boys believed that elites had failed to meet their terms of the agreement. In the days immediately following the two massacres, Moravian ministers wrote letters that contain, to date, the sole surviving traces of how the Paxton Boys understood their violence. Their correspondence offers unique insight into what lay beneath backcountry deference and what broke the truce between deference and paternalism. These letters not only show that the Paxton Boys believed that local elites had refused to provide the services that earned their deference; they also reveal that the deference they offered to Lancaster’s elites masked unarticulated (or unrecorded) desires. Moravian letters reveal, above all, that the wounds of class and status—and fury at a particular elite that had inflicted those injuries—provoked the Paxton Boys’ violence. During times of peace, frontiersmen accorded Lancaster elites the sort of self-interested deference described above. Frontier communities were eager to enlist leading men such as Shippen, the spigot from whom flowed employment and patronage, as “friends”—a common term that disguised arrangements based on mutual interest as affective relationships. One Scots-Irish immigrant that Shippen settled at Shippensburg, Pennsylvania’s westernmost outpost, was Francis Campbell. The “Plebian” Campbell was delighted to ally himself with the Lancaster grandee, noting in his diary that ‘‘I came here ten days ago, not as a matter of necessity, but as a matter of choice, and I find the country all that my friend, Mr. Shippen, represented it to be.” The “entire people of this settlement,” Campbell added, ‘‘is of Irish origin and Presbyterian in faith…. There is not a single family here who are not natives of the Province of Ulster” (Campbell Diary 319). When war resumed in summer 1763, Edward Shippen reaffirmed his frontier strategy in which well-populated frontier communities served as buffers between Indians and Lancaster. 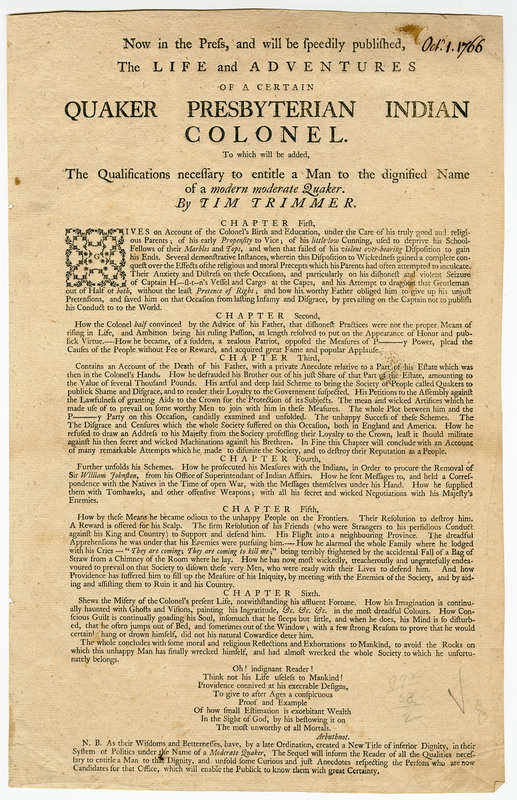 In June John Elder asked Shippen “to try to animate our folks this way to hire a Number of Men and send them up to guard the Frontiers at Paxton” (June 13, 1763, Edward Shippen to Joseph Shippen). But Shippen did not recruit men from Lancaster to defend frontier settlements. Instead, he urged frontier authorities to keep their communities of settlers in place. 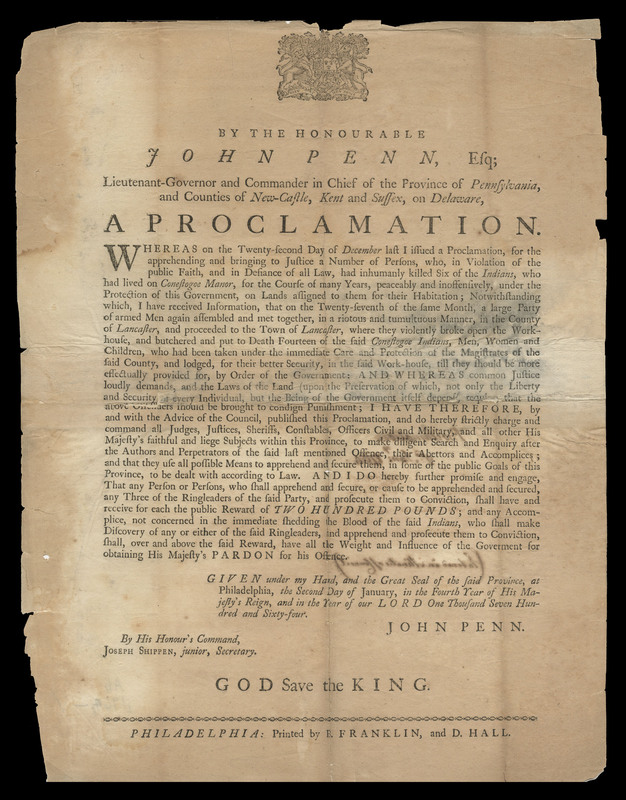 Shippen praised John Harris in July for “Spiriting the People up to Stay at Pextan” (July 25, 1763, Edward Shippen to Joseph Shippen) and he requested £1,000 to “raise, & pay, a hundred men” for defense, since only “then the Pextan people &c. will return home again” (Edward Shippen to James Burd). A few months later, Shippen reminded the governor that if he did not “send up a little money to Mr. Elder” so he could “hire and pay” his “little Garrison,” the “total Evacuation of Paxtan, Derry, and Hanover Townships” would result (Edward Shippen to Governor James Hamilton). “If the poor people do not receive due Encouragement to Stand their Ground at such Places,” Shippen wrote to his son-in-law, “the Savages will soon make inroads through the whole Province” (Edward Shippen to James Burd). He could not have stated more clearly his expectation that Scots-Irish Presbyterians must protect more important settlements, such as Lancaster, from Indian attack. The deference that frontiersmen were willing to extend to Lancaster’s elites shattered during this wartime crisis. The Paxton Boys were no longer willing to sacrifice themselves for the elites that, they felt, had abandoned them. 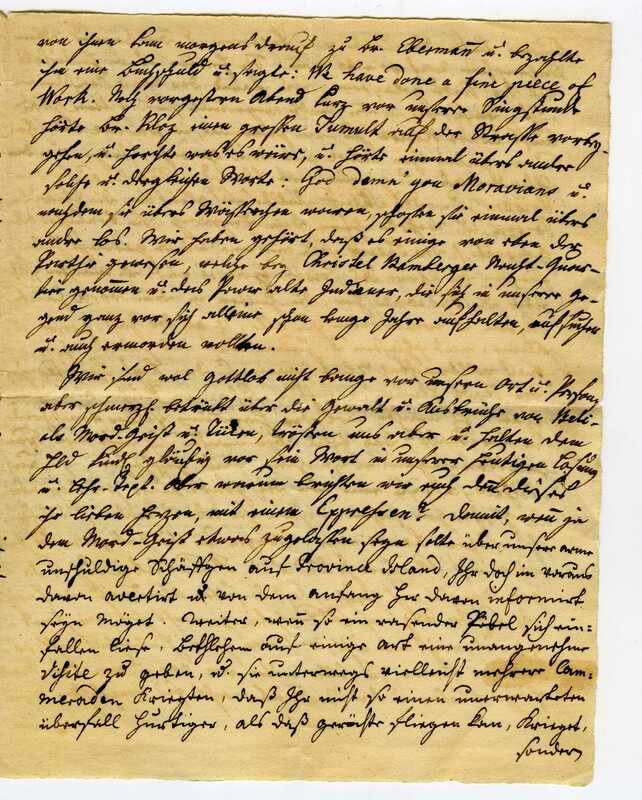 Remarks recorded only by the pastor of Lancaster’s Moravian church, Albrecht Ludolph Russmeyer, suggest that the killings at Conestoga Manor and at the Lancaster workhouse were intended as direct and public challenges to Lancaster’s elites. According to Russmeyer, the Paxton Boys “threatened Lancaster,” saying: “You peacefully drink your tea and coffee etc., live carefree, and we have to stand constantly at the ready on the borders expecting to be destroyed by Indians. We want to come live with you” (Russmeyer to Seidel). These remarks about “carefree” days filled with “tea and coffee” reveal the anger at Lancaster residents who seemed unconcerned about the vulnerability of those who lived on the frontier. The frontiersmen’s account, linking physical safety (“peacefully,” “carefree”) with material comfort (“tea and coffee”), indicted a small but visible segment of Lancaster’s population for their callous disregard of those they dismissed as “the meaner sort” (Barton to Burton). The frontiersmen’s threats exposed how the “meaner sort” viewed this elite—drinking tea and coffee while frontiersmen had to “stand constantly at the ready on the borders expecting to be destroyed by Indians.” Moreover, in this moment of crisis the frontiersmen stated a surprising desire—“We want to come live with you”—that remained unspoken under normal circumstances. a group of armed men, mostly Irish from Paxtown, came to Lancaster in a total rage, stopping in front of the house of Mr. Shippen. They announced that they intended to kill all Indians living on Manor Land. Mr. Shippen tried to dissuade them, but wasn’t able to prevent it. They did as they said they would, and fell upon the Indian village, murdering all who were there. Having completed their murders at Indian Town, Hehl added, “the murderers afterwards jubilantly paraded the scalps, their trophies of success, through Lancaster, and the townspeople laughed” (Hehl to Bethlehem). By returning to Lancaster and displaying evidence of their violence, the men from Paxton boasted that they had done exactly what Lancaster’s leading man had forbidden. Peter Silver has suggested that the Paxton Boys’ violence was “meant to convey a message” to provincial authorities about “what government policy should be” (Silver 182). This message was aimed, at least initially, not at Philadelphia’s provincial authorities but at Lancaster’s elites, who the Paxton Boys believed had failed as local patriarchs. Only later, when the frontiersmen rode to Philadelphia in February 1764, did provincial elites in that city feel threatened. 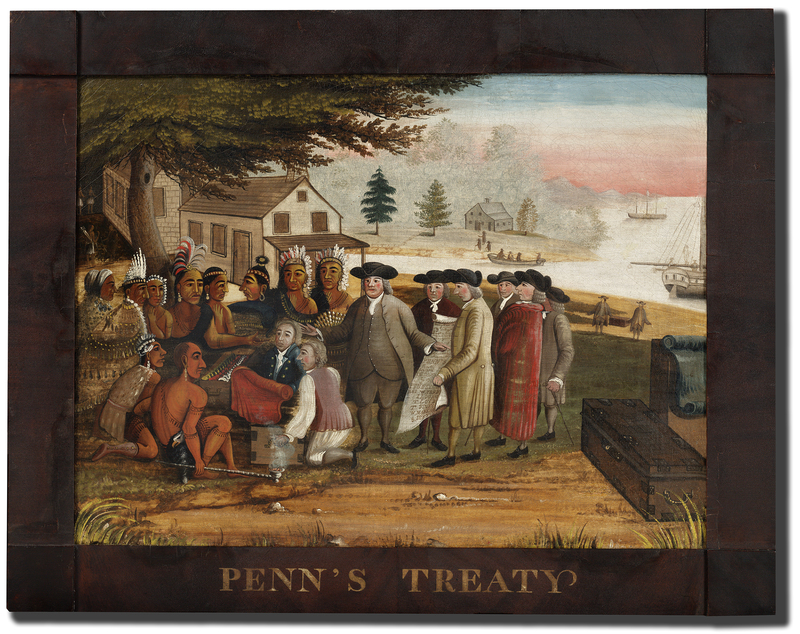 The armed men targeted Philadelphia because the Christian Indians, whom they aimed to eliminate, had been gathered there. But an expedition to Philadelphia brought the frontiersmen near the provincial elites who had befriended Indians. In early February, John Elder warned Provincial Secretary Joseph Shippen that the “Inhabitants are so exasperated against a particular set of men, deeply concerned in the Government”—Elder scratched out “Quakers”—“for the singular regards they have always shown to savages’’ that it would be ‘‘unsafe for any one to oppose their measures” (John Elder to Joseph Shippen). “The Rioters . . . are still roving about in companys,” Susanna Wright wrote in January, and “they Breath[e] vengeance against Israel Pemberton, Joseph Fox, and my Brother [John Wright]” (Susanna Wright to Isaac Whitlock). Pemberton sent his family away from Philadelphia as the frontiersmen approached. Even after they had retreated, men in Lancaster heard that “Paxtoners are arming themselves again in order to go to Philadelphia” and that they had promised “to bring back Quaker scalps” (Lancaster Congregational Diary). “Motives of fear or deference” that ordinarily restrain subaltern groups are often overcome when a group believes that it is “supported by the wider consensus of the community” (Thompson 118). The Paxton Boys, as Hebron’s Moravian pastor, Andrew Langaard, put it, “expect[ed] others to think the way they do” (Heisey 51). It is significant that the Paxton Boys did not gallop into Lancaster to murder the Conestogas and then flee as quickly as possible. They were in no hurry and did not hide from onlookers. On the contrary, riding in circles around Lancaster’s courthouse, yelling, shooting guns, they solicited the attention of Lancaster’s residents. They wanted visibility, as they had when they congregated at Shippen’s home before, and returned to Lancaster in triumph after, the December 14 murders. Some of the Paxton Boys boasted of their actions publicly. The morning after the workhouse slaughter, “a prestigious man” visited a Lancaster blacksmith “and paid a debt he owed and said: ‘We have done a fine piece of work’” (Hehl to Bethlehem). That the Paxton Boys’ identities remain unknown today does not testify to their stealth: it suggests that many Lancaster residents approved of the murderers’ actions and did not want them apprehended and punished. (Other residents may have feared to reveal the murderers’ names.) The fourteen murdered Indians were buried the day after the workhouse massacre. “Like dogs all 14 of them were thrown into a hole on top of one another without a blanket or covering,” Russmeyer wrote, “and the bystanders said: ‘Just as it should be,’ and cursed and reproached them” (Russmeyer to Seidel). 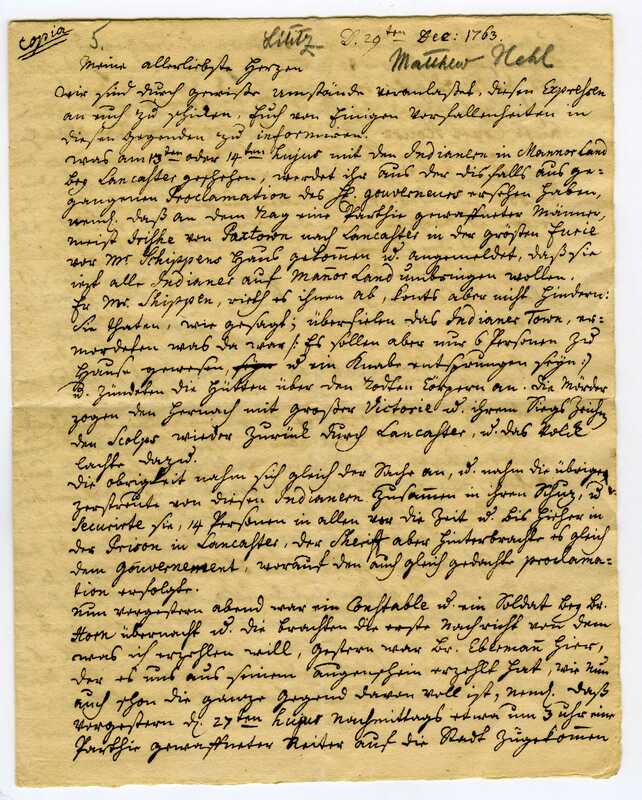 Matthäus Hehl in Lititz heard similarly that the Indian killings “didn’t seem to phase the residents [of Lancaster], who say that they had it coming to them” (Hehl to Bethlehem). These citizens of Lancaster joined the Paxton Boys in holding Indians responsible for backcountry violence and were willing to show this support publicly. The Paxton Boys’ actions exposed differences of allegiance within Lancaster’s population. Few in Lancaster may have sympathized with Indians. But elites such as Edward Shippen—or Lancaster’s sheriff, whom the Paxton Boys injured when he confronted them—opposed the Paxton Boys’ actions because they objected to the violation of authority that their extra-legal violence represented. Their violent acts, John Penn insisted, were “insults upon the Government & its Laws” (Penn to Gage), violations of order and hierarchy. Philadelphia Presbyterians, the Paxton Boys’ co-religionists, used the crisis in Lancaster county to attack Quaker elites for failing to preserve peace in Pennsylvania. But if Pennsylvania’s competing elites opportunistically leveraged the Paxton crisis to jockey for political advantage, they united in their horror at unauthorized “Plebian” violence. The Presbyterian merchant George Bryan, for instance, denounced the Paxton Boys as a “mean and lower sort of people” and insisted on the “necessity of supporting order” (Foster 46). The Paxton Boys, like the eighteenth-century English crowds that E. P. Thompson analyzes, believed that they were “defending traditional rights or customs” (Thompson 118). They demanded the protection to which they felt entitled. Their rage at Lancaster elites (and, later, at Quaker elites in Philadelphia) did not mean that the Paxton Boys were demanding social or political equality, which, as Gregory Nobles reminds us, is not the only alternative to deference (Nobles 290). The Paxton Boys’ most surprising expression—“We want to come live with you”—exposed a desire eliminate the geographical distance that kept elites insulated from and the frontiersmen endangered by frontier violence. It stopped short of envisioning social equality. 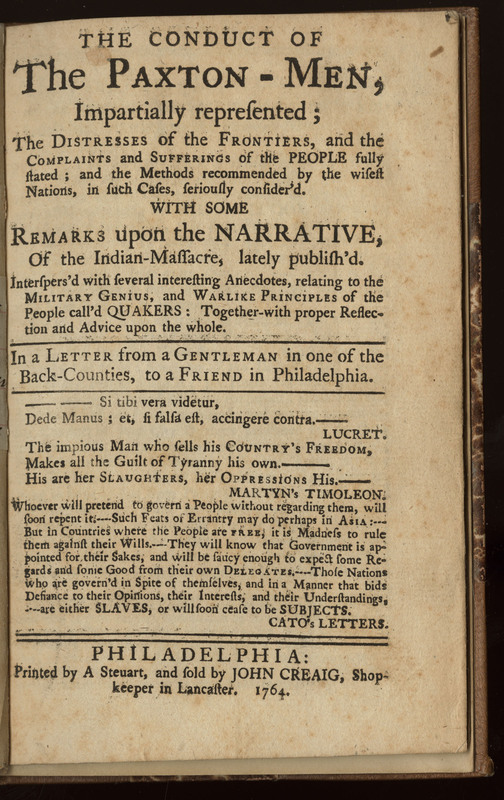 Their violence sought to compel Lancaster’s authorities and provincial authorities to exercise their influence to protect frontier communities, not to challenge fundamentally the distribution of social power in Pennsylvania or claim the authority of elites. “If the upper class as a whole failed in what the masses saw as the aristocracy’s duty,” Lynn Nelson argues, “ordinary farmers turned to a long European tradition of extra-legal, but rarely revolutionary, violence” (Nelson 4). The Paxton Boys were not agitating for political power in 1763. They were demanding that local elites meet their responsibilities. The frontiersmen’s triumphant excursions to Lancaster before and after killings at Conestoga Manor served as a rebuke that sought to shame Lancaster authorities into acting as responsible patriarchs. 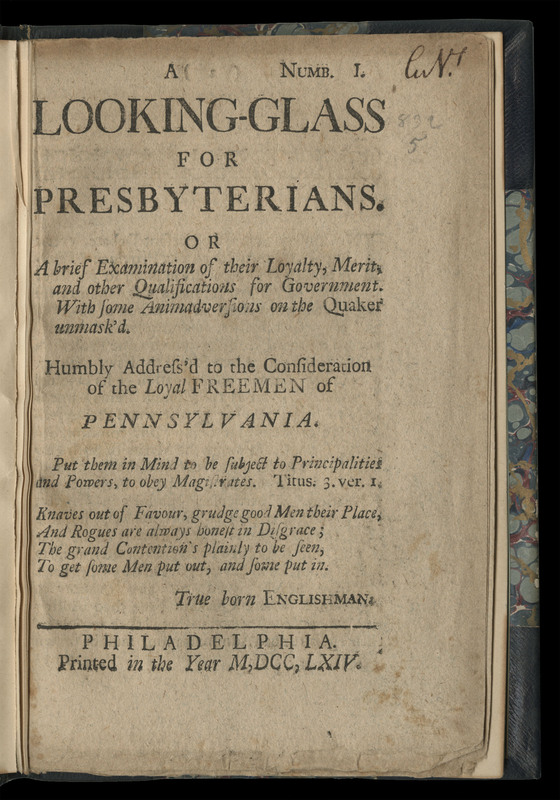 Only a decade later, during the Revolutionary crisis, did Scots-Irish Presbyterians such as George Bryan, Thomas McKean, and Joseph Reed displace Pennsylvania’s established elite of Anglicans and Quakers. These men did not invoke the extra-legal violence of 1763 to justify their political ambition: the Paxton Boys’ actions still signified unacceptable disorder. The Paxton Boys may have hoped that ‘‘White patriarchs in Philadelphia’’ would recognize that they ‘‘owed their loyalty and support first and foremost to their fellow White patriarchs on the frontier and not to the Indians who also resided there,’’ but elites ignored these pleas for ‘‘racial unity” (Camenzind 216). Instead, elites unified in their denunciations of “frontier justice,” of violence by those whom Bryan called the “mean and lower sort of people” (Foster 46). The difference between plebian and elite trumped the difference between red and white. Thomas Barton to Daniel Burton, November 16, 1764, in James P. Myers Jr., The Ordeal of Thomas Barton: Anglican Missionary in the Pennsylvania Backcountry, 1755–1780 (Bethlehem, PA: Lehigh University Press, 2010), 209-216. Krista Camenzind, ‘‘Violence, Race, and the Paxton Boys,’’ in William A. Pencak and Daniel K. Richter, eds., Friends and Enemies in Penn’s Woods: Indians, Colonists, and the Racial Construction of Pennsylvania (University Park: Pennsylvania State University Press, 2004), 201-20. Francis Campbell, Diary, in Kerby A. Miller et al., eds., Irish Immigrants in the Land of Canaan: Letters and Memoirs from Colonial and Revolutionary America, 1675–1815 (New York: Oxford University Press, 2003), 317-323. 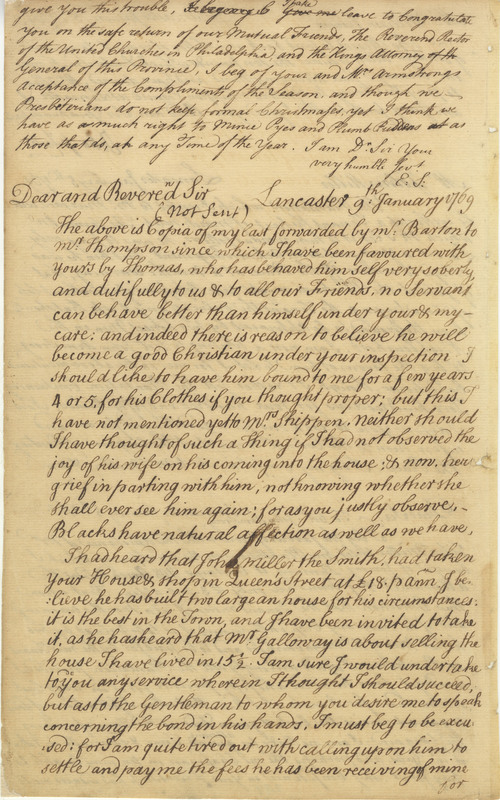 John Elder to Joseph Shippen, February 1, 1764, Rev. 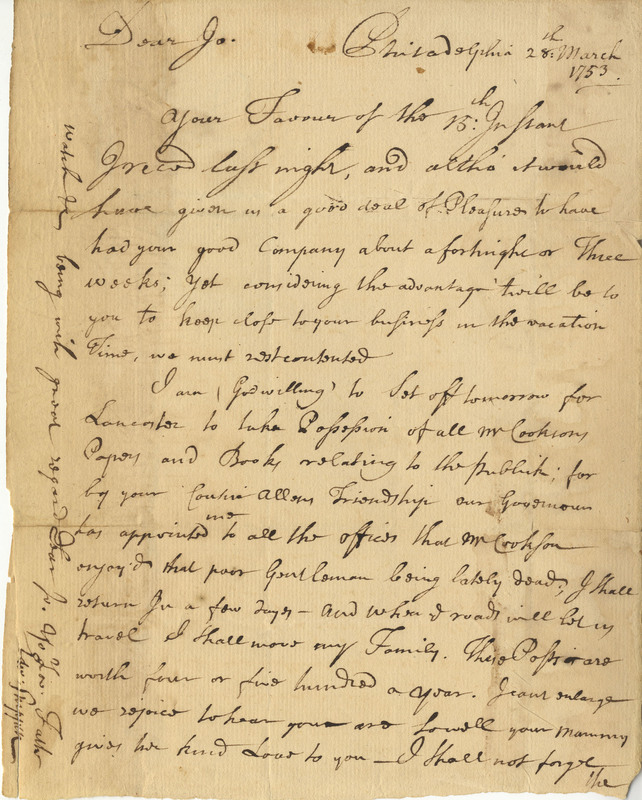 John Elder Correspondence, 1754–1763, Elder Collection, MG 070, Historical Society of Dauphin County, Harrisburg, Pennsylvania. Joseph S. Foster, In Pursuit of Equal Liberty: George Bryan and the Revolution in Pennsylvania (University Park: Penn State University Press, 1994). 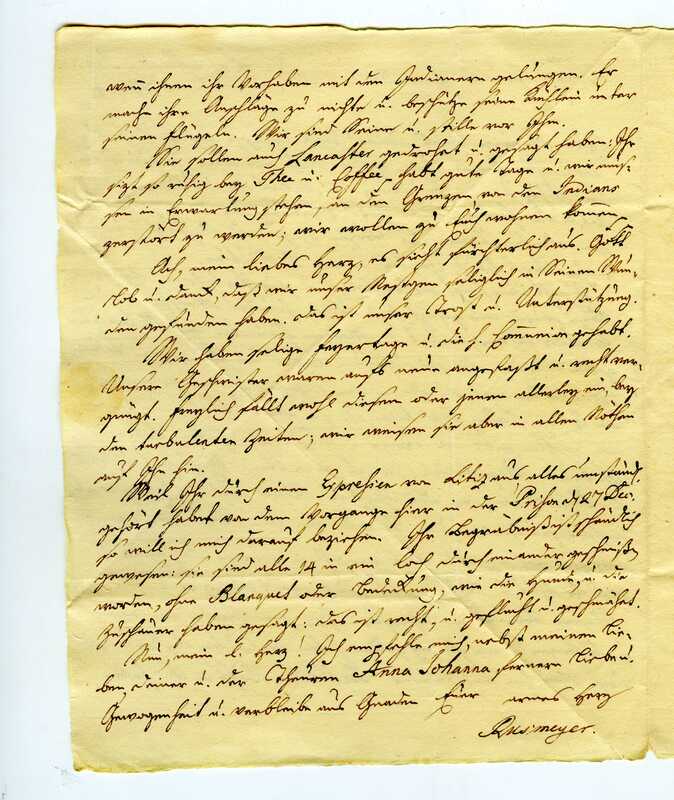 Matthäus Hehl to Bethlehem Authorities, December 29, 1763, Records of the Indian Missions, 1742–1898, box 127, folder 5, Moravian Archives, Bethlehem. Lancaster Congregational Diary, February 29, 1764, Moravian Archives, Bethlehem. 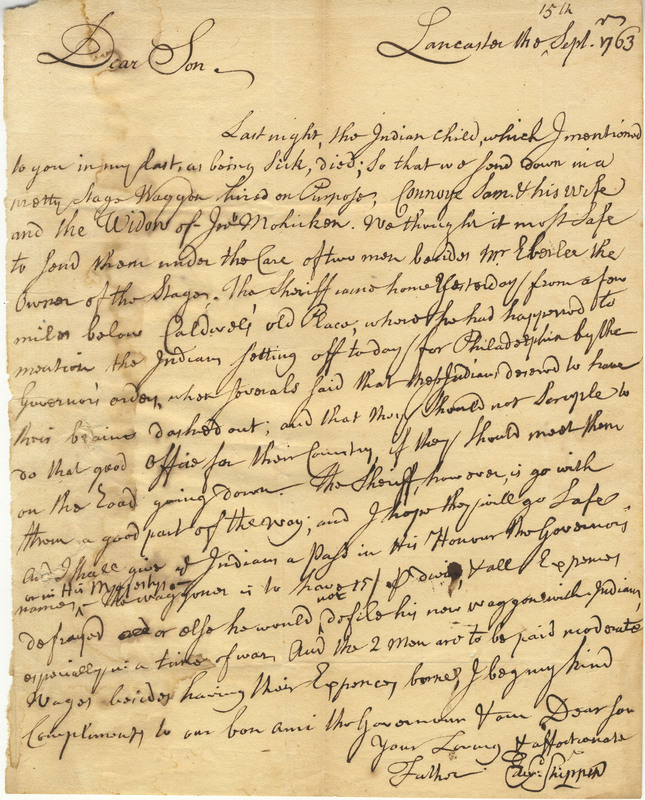 James Logan to James Steel, November 18, 1729, Logan Family Papers, 10:46, Collection 0379, Historical Society of Pennsylvania, reprinted as “Letter of Instruction of James Logan to James Steel, on Proprietary Affairs, 1727,” PMHB 24, no. 4 (1900): 495–99. 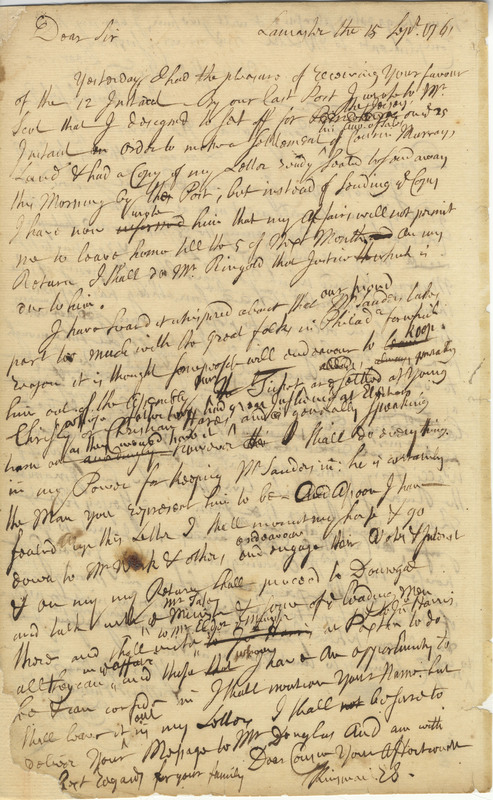 James Logan to John Penn, October 18, 1728, Logan Letterbook, 3:279, Logan Family Papers, Historical Society of Pennsylvania. Lynn A. Nelson, ‘‘Historiographical Conversations about the Backcountry: Politics,’’ Journal of Backcountry Studies 2, no. 2 (2007): 1-10. Gregory Nobles, ‘‘A Class Act: Redefining Deference in Early American History,’’ Early American Studies 3, no. 2 (2005): 286-302. Gov. John Penn to General Thomas Gage, December 31, 1763, in Colonial Records, 9:105. Ronald Schultz, “A Class Society? The Nature of Inequality in Early America,” in Inequality in Early America, eds. Carla Gardina Pestana and Sharon V. Salinger (Hanover: University Press of New England, 1999), 204-21. 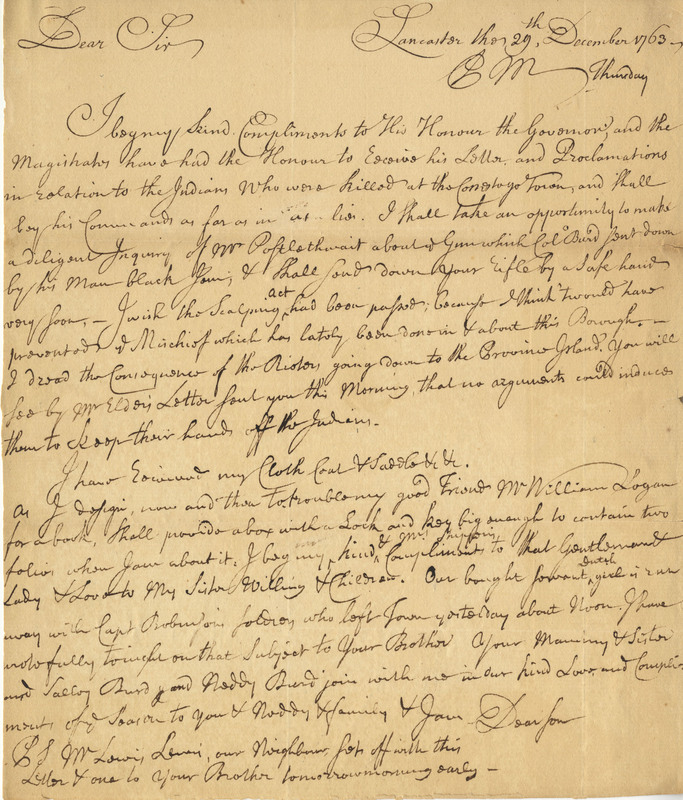 Edward Shippen to James Burd, July 15, 1763, Shippen Family Papers, 6:35, Historical Society of Pennsylvania. 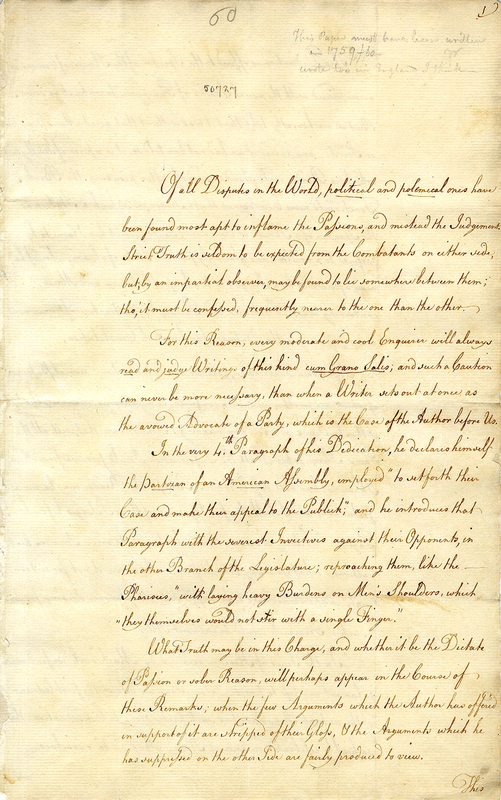 Edward Shippen to Governor James Hamilton, October 29, 1763, Shippen Letters and Papers, American Philosophical Society. Edward Shippen to Joseph Shippen, June 13, 1763, Shippen Letters and Papers, American Philosophical Society. Edward Shippen to Joseph Shippen, July 25, 1763, Shippen Letters and Papers, American Philosophical Society. Willis L. Shirk Jr., “Wright’s Ferry: A Glimpse into the Susquehanna Backcountry,” PMHB 120, nos. 1–2 (1996): 61-87. Peter Silver, Our Savage Neighbors: How Indian War Transformed Early America (New York: W. W. Norton, 2008). E. P. Thompson, “The Moral Economy of the English Crowd in the Eighteenth Century,” Past and Present 50 (1971), reprinted in Customs in Common: Studies in Traditional Popular Culture (New York: New Press, 1993), 185-258. Jerome H. Wood, Conestoga Crossroads: Lancaster, Pennsylvania, 1730-1790 (Harrisburg: Pennsylvania Historical and Museum Commission, 1979). 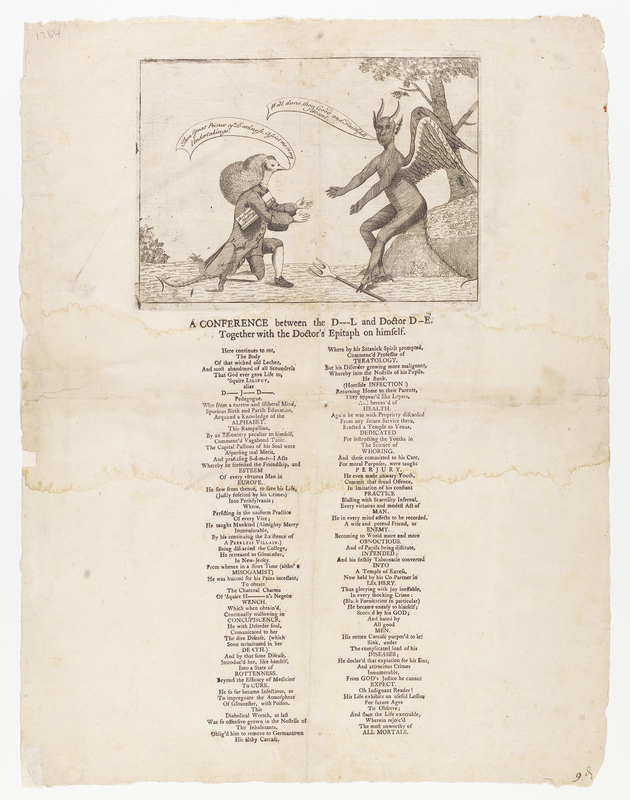 Susanna Wright to Isaac Whitlock, January 16, 1764, Pemberton Papers, Parrish Collection, Historical Society of Pennsylvania..
Keith Wrightson, “Class,” in The British Atlantic World, 1500-1800, ed. David Armitage and Michael J. Braddick (New York: Palgrave, 2002), 133-53. Jasper Yeates to Duncan Campbell, December 9, 1769, Yeates Letterbook, 1769-1771, Am.196, Historical Society of Pennsylvania.